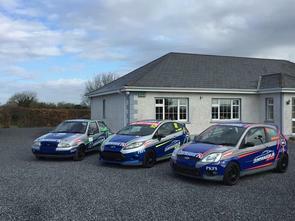 Carzone is proud to support local Irish motorsport with Kellett Motorsport in this year's Ford Fiesta Championships. For 2019, the family-run Kellett Motorsport race team will contest three different Ford Fiesta Championships with three drivers. The Kells-based team has been working hard behind the scenes to put together a competitive package for the 2019 season, and it will compete in both Irish and UK championships. This year, 18 year old William Kellett will once again compete in the Keelan Construction Fiesta Zetec Championship. After finishing runner-up in 2018, the three-time Motorsport Ireland Young driver of the year Nominee has his sights set firmly on winning the closely fought Championship. William will be driving an upgraded car this season and hopes to get off to a flying start on the 13th and 14th of April in Mondello Park. Carzone look forward to updating you on Kellett Motorsport's results as the season progresses. Dunshaughlin's Barry-John McHenry has been part of the Kellett Motorsport family since 2011 and he will once again compete in the Mondello Park Fiesta ST Championship. This is Barry-John's third season in the ST Championship and after showing great pace and finishing joint fourth place in 2018, he hopes to step it up and challenge the front runners such as Erik Holstein, Kevin Doran, Ronan McHale, Alex Denning and many more. The third driver is Alastair Kellett, a multiple champion who is competing in the MRF Fiesta UK Championship in a newly-acquired Ford Fiesta Zetec S. Alastair won this Championship in 2016 and returns after a new structure was announced for the 2019 season. This will see Alastair travel across the Irish Sea eight times over the course of the season, going against the top UK teams with the aim of coming out on top as he did In 2016. The trio will also team up together for a 24 Hour Kart race in White River kart track in May and they will all compete at the Formula Ford Festival in October in Brands Hatch. Carzone along with the rest of Kellett Motorsport's proud sponsors wish the team a safe ans succesful race season for 2019. We look forward to updating you on their progress as the season progresses.